There's been a lot of fuss made lately over memory inspection and profiling tools for Ruby implementations. And it's not without reason; inspecting a Ruby application's memory profile, much less diagnosing problems, has traditionally been very difficult. At least, difficult if you don't use JRuby. Because JRuby runs on the JVM, we benefit from the dozens of tools that have been written for the JVM. Among these tools are numerous memory inspection, profiling, and reporting tools, some built into the JDK itself. Want a heap dump? Check out the jmap (Java memory map) and jhat (Java heap analysis tool) shipped with Hotspot-based JVMs (Sun, OpenJDK). Looking for a bit more? There's the Memory Analysis Tool based on Eclipse, the YourKit memory and CPU profiling app, VisualVM, now also shipped with Hotspot JVMs...and many more. There's literally dozens of these tools, and they provide just about everything you can imagine for investigating memory. In this post, I'll show how you can use two of these tools: VisualVM, a simple, graphical tool for exploring a running JVM; and the jmap/jhat combination, which allows you to dump the memory heap to disk for inspection offline. All these tools work with any version of JRuby, but as part of JRuby 1.6 development I've been adding some enhancements. Specifically, I've made some modifications that allow Ruby objects to show up side-by-side with Java objects in memory profiles. A little explanation is in order. In JRuby, all the core classes are represented by "native" Java classes. Object is represented by org.jruby.RubyObject, String is org.jruby.RubyString, and so on. Normally, if you extend one of the core classes, we don't actually create a new "native" class to represent it; instead, all user-created classes that extend Object simply show up as RubyObject in memory. This is still incredibly useful; you can look into RubyObject and see the metaClass field, which indicates the actual Ruby type. Let's see what that looks like, so we know where we're starting from. We'll run a simple script that creates a custom class, instantiates and saves 10000 instances of it, and then sleeps. From this, you can see I have three JVMs running on my system right now: jps itself; our JRuby instance; and a GlassFish server I used for testing earlier today. We're interested in the JRuby instance, pid 52857. Let's see what jmap can do with that. -histo[:live]        to print histogram of java object heap; if the "live"
all objects in the heap are dumped. The simplest option here is -histo, to print out a histogram of the objects on the heap. Let's run that against our JRuby instance. 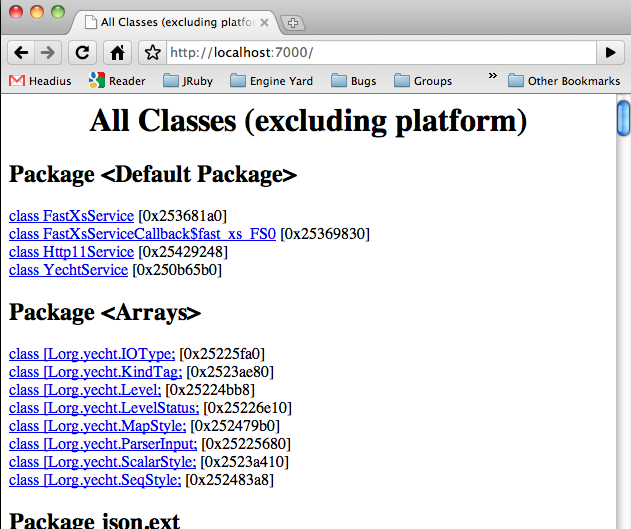 The resulting output is a listing of literally every object in the system...not just Ruby objects even! The value of this should be apparent; not only can you start to investigate the memory overhead of code you've written, you'll also be able to investigate the memory overhead of every library and every piece of code running in the same process, right down to byte arrays (the "[B" above) and "native" Java strings ("java.lang.String" above). And so far we haven't had to do anything special to JRuby. Nice, eh? So, back to the matter at hand: the Foo class from our example. Where is it? Well, the answer is that it's right there; 10000 of those 10002 org.jruby.RubyObject instances are our Foo objects; the other two are probably objects constructed for JRuby runtime purposes. But obviously, there's nothing in this output that tells us how to find our Foo instances. This is what I'm remedying in JRuby 1.6. On JRuby master, there's now a flag you can pass that will stand up a JVM class for every user-created Ruby class. Among the many benefits of doing this, we also get a more useful profile. Let's see how to use the flag (which will either be default or very easy to access by the time we release JRuby 1.6). If we run jmap against this new instance, we see a more interesting result. A-ha! There's our Foo instances! The "reify classes" option generates a JVM class of the same name as the Ruby class, prefixed by "ruby." to separate it from other JVM classes. Now we can start to see the real power of the tools, and we're just at the beginning. Let's see what a simple Rails application looks like. ~/projects/jruby ➔ jmap -histo:live 52926 | grep " ruby." This time I've opted to grep out just the "ruby." items in the histogram, and the results are pretty impressive! We can see the baffling fact that there's 970 instance of Gem::Version, using at least 23280 bytes of memory. We can see the even more depressing fact that there's 11685 live instances of TZInfo::TimezoneTransitionInfo, using at least 280440 bytes. Now that we're getting useful data, let's look at the first of our tools in more detail: jmap and jhat. As you might guess, I do a lot of profiling in the process of developing JRuby. I've used probably a dozen different tools at different times. But the first tool I always reach for is the jmap/jhat combination. You've seen the simple case of using jmap above, generating a histogram of the live heap. Let's take a look at an offline heap dump. That's how easy it is! The binary dump in heap.bin is supported by several tools: jhat (obviously), VisualVM, the Eclipse Memory Analysis Tool, and others. It's not officially a "standard" format, but it hasn't changed in a long time. Let's have a look at jhat options. -stack false:     Turn off tracking object allocation call stack. be excluded from the reachableFrom query. be marked as not being "new". -debug <int>:     Set debug level. by appending "#<number>" to the file name, i.e. "foo.hprof#3". All boolean options default to "true"
Generally you can just point jhat at a heap dump and away it goes. Occasionally if the heap is large, you may need to use the -J option to increase the maximum heap size of the JVM jhat runs in. Since we're running a Rails app, we'll bump the heap up a little bit. "Server is ready"? Damn you Java people! Does everything have to be a server with you? In this case, it's actually an incredibly useful tool. jhat starts up a small web application on port 7000 that allows you to click through the dump file. Let's see what that looks like. Here's the front page of the tool. 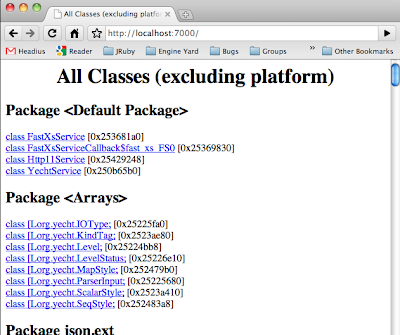 We see a listing of all JVM classes in the system. If you scroll to the bottom, there's a few more general functions.